Multi-Frequency PENTAX fluid mixers are used where two mutually insoluble liquids must be continuously mixed into a stable emulsion, or where solids in suspension must be dispersed as finely as possible in a viscous liquid.. The multi-frequency liquid mixer comprises a series of opposed rotors and stators on a common axis. The rotors are fitted with milled teeth for low viscosity applications and with round studs for use with viscous fluids. Inside the PENTAX fluid mixer, constantly changing areas of rapid flow and resistance subject the liquid to high frequency acceleration and deceleration. The resulting high energy shear forces result in effective dispersion and emulsification. The PowerMon Titrometer is a versatile applicable online measuring instrument. It guarantees a permanent optimal water quality by the continuous supervision in the chemical industry, water and waste water treatment, in power stations and the paper industry..
Apart from higher precision and shortening of the measuring cycles the PowerMon offers a special highlight: For the measurement of most diverse parameters (e.g. oxygen, pH, redox, conductivity etc.) the connection of various sensors is possible!. For the individual sensors the PowerMon automatically takes over the functions of a transducer. It is also possible to set the separate results against each other..
A remote supervision enables the permanent control of the correct function of your plant. The highest possible data transfer over the interfaces, as well as the operation of the PowerMon via the touch screen user interface ensures an easy and user friendly operation..
Housings of stainless steel 1.4571 or 1.4462, or plastic PVC or PP. Diaphragms of PTFE or stainless steel 1.4310. Plungers of stainless steel or ceramic. Options: materials such as Super Duplex, Hastelloy, Titanium and other materials. Worm gear with different reduction ratios. Stroke length adjustment via eccentric (Z-shape) crankshaft. The PowerMon S analyzer is a compact closed multi-component measuring system. It bases on the spectroscopic measuring principle. The usability could be enhanced perceptible. compared to the DiaMon the costs for this analyzer has been reduced drastically..
One PowerMon S replaces several single-parameter analyzers. Pre-calibrated for quick and easy installation: needs only a simple on-site adjustment to local sample conditions. Connection of external physical sensors and actuators. Materials of construction of liquid-wetted parts. Housings of stainless steel 1.4571 or 1.4462 or plastic PVC or PP. Manual, electric, pneumatic or speed variation. Electric motor with fixed or variable speed. In process water and environmental monitoring higher energy costs and regulatory requirements make continuous quality controls essential. On-line measurements are necessary to identify immediately if limits are exceeded. In the process control, our analytical equipment guarantees a reliable control, ensure consistent product quality, and contribute to the safety and efficiency. Worm gear with a variety of five different reduction ratios. Stroke length adjustment via eccentric (Z-shape) crankshaft . CeraClean removes solids, colloids and high molecular weight interfering substances from dirty samples. CeraClean is used with the Bran Luebbe Monitor 90 S and DiaMon, delivering a continuous supply of purified sample for analysis. Housings of stainless steel 1.4571 or 1.4462. Proven design – Experienced with installations..
Low Maintenance – No continuous maintenance necessary..
Low running costs – No tube changes, no chemicals..
Easy cleaning – Normally every 2 to 6 weeks. Raise it, wipe it, replace it! It takes only 1 minute. Housings of St. Steel 1.4571 or 1.4462. Stroke lenth adjustment via eccentric (Z-shape) crankshaft . Manual, electrical, pneumatical or speed variation. Economical and reliable, the robust and compact design of the ProCam plunger pump allows high operational security..
Economic metering of non-hazardous fluids. Operating pressure up to 80 bar. Flow rates from 0.16 to approx. 60 l/h. Robust gear technology with proven lost motion design for continuous. operation at max. flow / pressure conditions. Linear stroke adjustment with manual or electric options. Gear box in a rugged cast iron housing. Manual, electric, pneumatic or speed variation . Our classic series of mechanically actuated double diaphragm pumps for low to medium range applications, brings the advantages and security of the double diaphragm concept to a wide variety of applications at an economical price..
Hermetically sealed pump head with mechanically operated PTFE double diaphragm allowing. – safe metering of hazardous liquids. – con***ination free operation (important in potable water production). 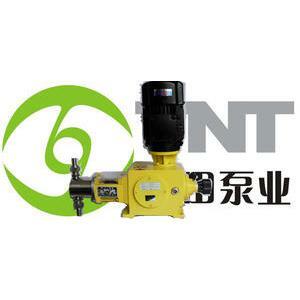 Allows economic operation without loss in operating safety and reliability. 2 years warranty of PTFE double diaphragm. Outstanding corrosion resistance due to high quality PTFE double diaphragm. Diaphragm pump EHEDG* certified #8211; designed according to EHEDG guidelines. (*European Hygenic Engineering and Design Group). Covers requirements in hygienic and sterile applications. Specifically designed for applications in the pharmaceutical industry, biotechnology, cosmetics, personal care, food and beverage industry. Metering pump with PTFE double diaphragm (FDA approved) and diaphragm condition monitoring by pressure switch. Little residence time in the product chamber of the pump head. Double diaphragm and valve gaskets are made of PTFE (FDA). Coating according to FDA requirements. We provide unparalleled global expertise in diverse markets such as Oil amp; Gas, Petrochemical, Chemical Processing, Food amp; Beverage, Toiletries amp; Detergents, Pharmaceutical and Water Treatment. The individual demands of these industries are well understood by our engineers by offering precise application and technical solutions..
Once process parameters are established during an initial review meeting our engineering team will develop and design a proposed solution that meets all requirements allowing for any potential problem areas such as NPSH. Where necessary, control systems can be included to cover Batch, Flow or Proportional Control into a main line stream including PLC that can link to SCADA for recipe download, alarms and reporting as required to suit the process..
By placing the responsibility for the project with SPX Flow Technology our customers can free up their valuable time by dealing with one supplier in the knowledge that the design, selection and sourcing of equipment as well as assembly, testing and supply will result in a process that will function fully to their expectations..
We have a dedicated team providing spare parts, regular servicing, service contracts including 24/7 support, on or off line diagnostics, technical support, training and refurbishments along with any warranty issues. The PowerMon Kolorimeter is a versatile applicable online measuring instrument. It guarantees a permanent optimal water quality by the continuous supervision of the legally prescribed limit value for total phosphate and ortho-phosphate in the outlet of municipal and industrial. Compact design based on the ProCam metering pump this is a convenient solution for chemical preparation and metering.. Stable base plate for pumps up to 50 kg. Fluid temperature up to 60#176;C.
Tank UV stabilised for outdoor use. Polyethylene tank material corrosion resistant against many chemicals. Brackets for floor mounting available. Tank sizes from 60 to 500 litres (or on request). Standard equipment includes metering pump, tank, suction pipe, inlet valve, manual stirrer and stable mounting plate for pumps. Easy to read liquid level due to scale moulded into the tank wall. Wide filling port with manual screw lid for easy handling. Level switches (1 or 2 contacts). Pressure relief valve with return to the tank. The NOVAPLEX Vector process diaphragm pump combines the reliability of the Bran Luebbe diaphragm technology with a compact unique gearbox design. This allows for the use of a process diaphragm pump for applications where a small foot print is required. An interface for the NOVALINK CSM on-line diagnosis system is integrated..
Max. capacity : up to 65.000 l/h. up to 400 bar with PTFE diaphragm. up to 1000 bar with metal diaphragm. High reliability with proven B L diaphragm pump technology with Positive Diaphragm Position Control (PDPC). Small foot print due to compact design. Low noise due to utilization of 4- resp. 6-poles motors. Flow rate adjustment by variable speed drive. Integrated interface for NOVALINK CSM on-line diagnosis system.